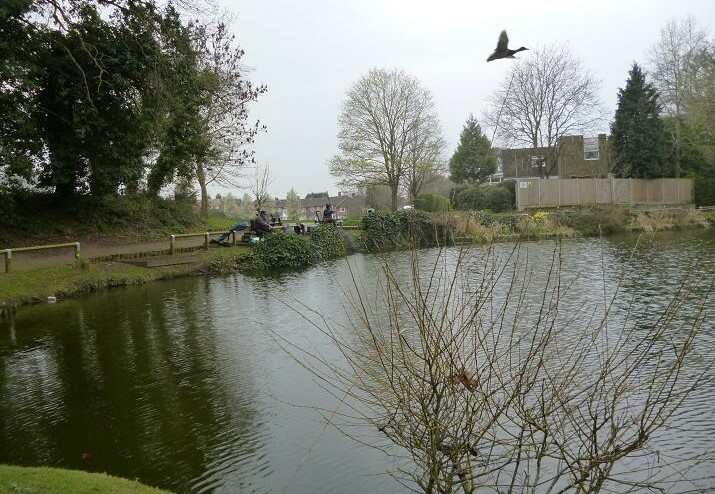 A few weeks ago one of my old match teammates invited me down to fish the prolific Jeanes pond in Braybrooke recreation ground close to my home. 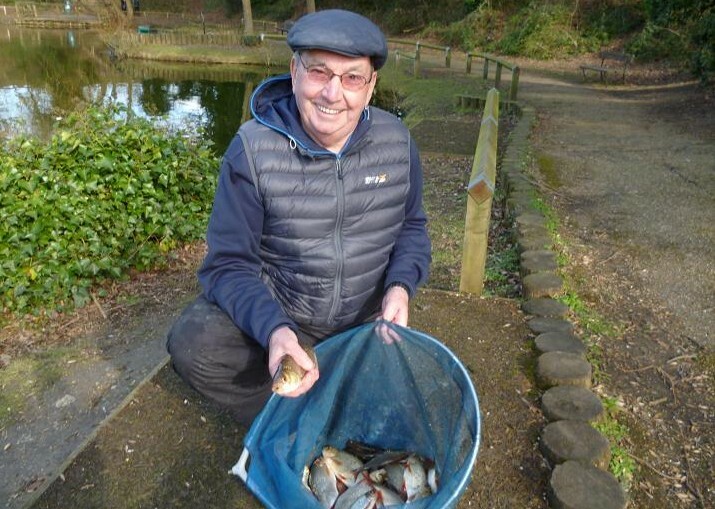 We had not fished together since our competitive days, but I knew that he would be out to give me a thrashing on what is now his weekly fishing venue. Arriving at the agreed time, I had found John already set up with rod in hand waiting for the off. After 4 hours fishing our weights had been close, the waggler float and maggot technique of John netting 8 lb 12 oz to my 8 lb 4 oz on the pole and bread punch. Fishing my swim for the first time, I felt that I had not got the best out of it, despite a very respectable weight, so when an email arrived inviting me to join John and another ex-teammate Frank at the pond, I was happy to oblige. Again with the intention of only fishing the bread punch, I arrived to find them already fishing! A chill east wind was blowing the length of the pond causing a drift from right to left, not too much of a problem for me being able to sink the tip of my pole, but the two waggler anglers were at a disadvantage. John was still casting and feeding maggots toward the middle, where he had found a better stamp of fish before, but Frank had come in closer, having seven roach to John’s one as I began to tackle up. Plumbing my swim, it dropped away rapidly from two metres deep at three metres, to three metres at four metres and opted to fish with three metres of pole just off bottom, burying the size 16 hook in a 6 mm bread pellet. A pigeon egg sized ball of liquidised bread brought a bite immediately, but missed the first few sailaways, before the first of many roach came to hand. Reducing the depth on the float brought more positive bites, although many fish were under an ounce, over forty fish in the first hour putting only a couple of pounds in the net, enough to match my previous weight, but not enough to reach my expected target of 10 lbs in four hours. Eighty fish had scaled over 8 lbs previously. 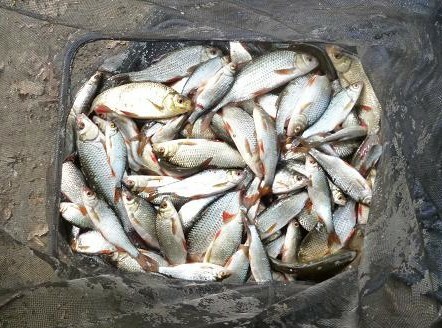 Better fish were there, but few and far between as the quantity climbed. A half time tea break was called just as I hooked a nice golden rudd and by this time felt that the deficit with Frank had been made up, while John was slipping behind both of us. Taking time out for a sandwich, I could see that spring was coming to this shady spot, wild flowers growing on the far bank. The three metre line was slowing and put a couple of balls of feed in at five metres, adding another joint to the pole, while increasing the depth on the float. The float sank away and I was playing a better roach, that suddenly jumped clear of the water with a pike chasing it, unceremoniously swinging it in away from the green spotted monster. The pike moved away, surfacing next to John’s float, 7 to 8 lb he estimated, killing their swim, so they decided to pack up early. Lifting into a bite before going down to weigh their fish, the elastic came out on my pole with a very good roach or rudd thumping slowly deep in the pond. Waiting to see the fish to net it, the hook came out. Probably tried to rush it? John had some good fish in his net, the scales measuring just over 7 lbs, while Frank’s weight had been swelled by some clonking rudd. Frank was pleased to have easily surpassed John’s weight with 8 lb taken on the waggler and maggot only ten yards from the bank. 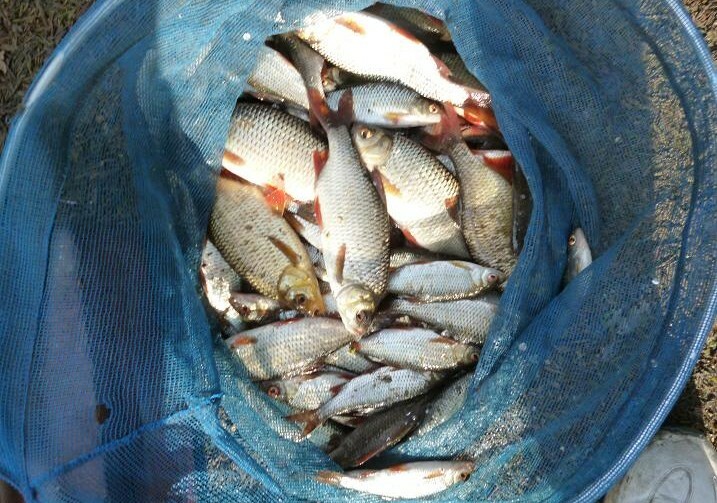 With still 30 minutes to make up on the other two, I wanted to fish on, but we pulled my net out to weigh the haul of around 130 roach and rudd, which pushed the scales to 8 lb 8oz. I had beaten them both, the better sized fish swinging it. 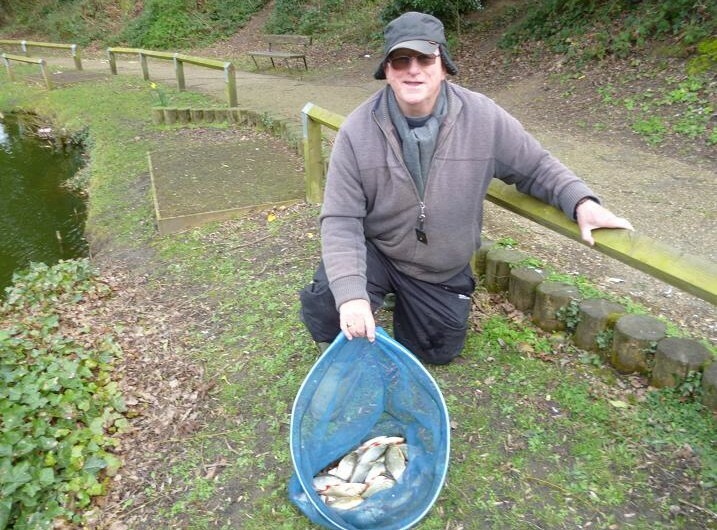 We had all caught well on a cold windy day, different baits and methods being rewarded. 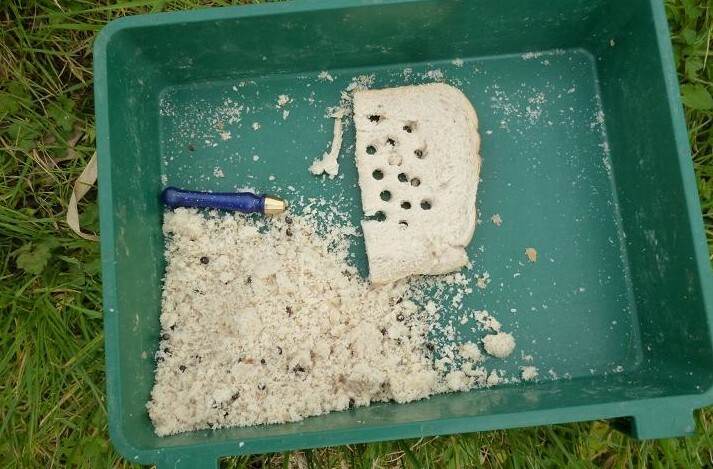 While John and Frank packed up, the last of my bread feed was scraped together in the tray to form two small balls, which were plopped in on a 4 to 5 metre line, followed by my float rig, which was allowed to drift down through the cloud. More bites followed, most two to three ounce silvers, with a few larger specimens. This roach had part of a gill cover missing, but was otherwise in perfect condition and fought well. 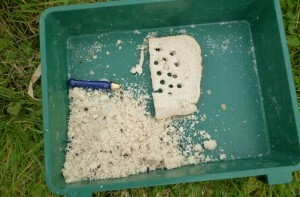 I stopped short of the 30 minutes, as I had used up my punch bread, roach number 140 being my last of the day. 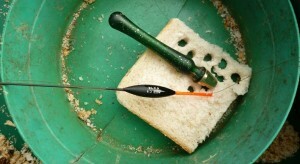 Once more the bread punch had more than held it’s own against skilled anglers on the maggot and pinkie. 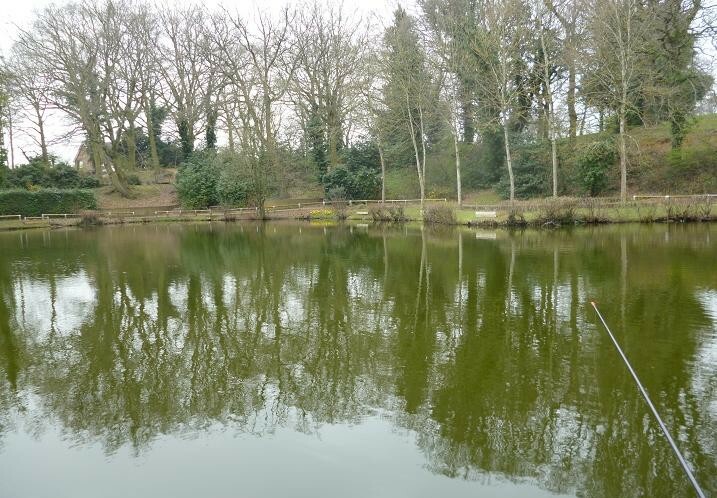 Weighing up my final catch I had missed my target four hour 10 lb weight by a mere 4oz, but feel that the surface of this pond has just been scratched and look forward to the warmer months, when tench, crucians and the mythical koi carp show up. 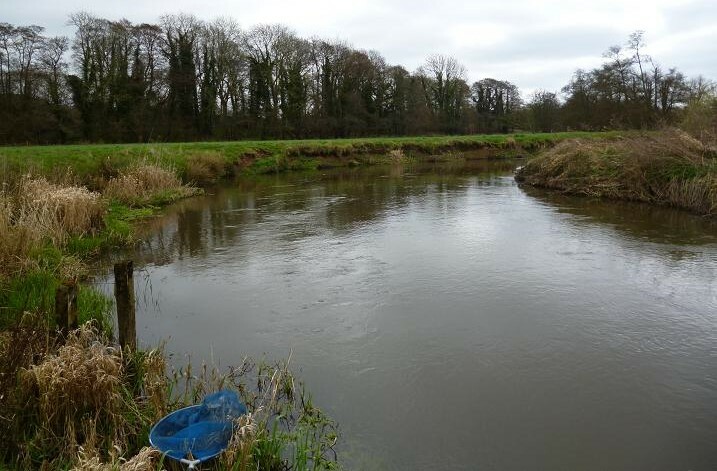 The last day of the coarse river fishing season often sees balmy spring like weather, but grey skies and a strengthening wind put paid to that theory. 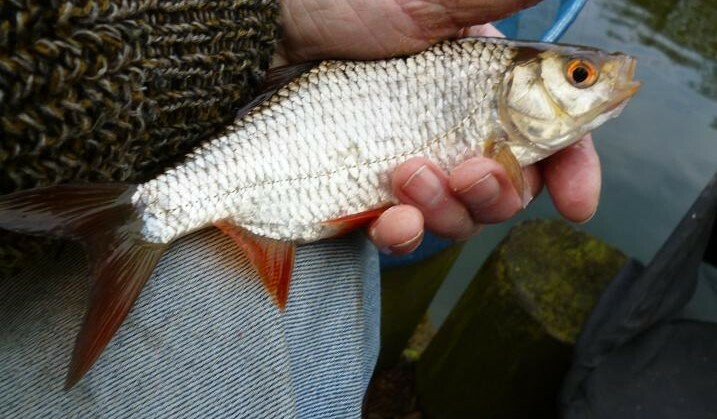 In recent years I have spent my last day catching big roach on the small river close to home, but with a couple of major pollution events since the new year, this river is now off my radar. 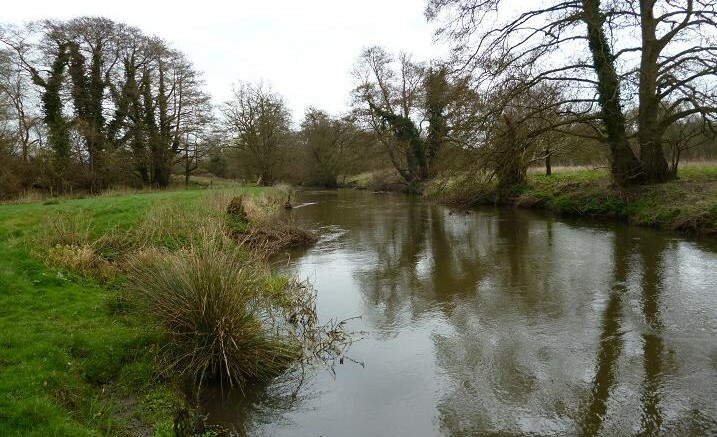 With a club membership that includes the upper river Wey, I took a chance that the water’s chub would respond to my bread punch and heavy crumb feed to round off the season. Leaving home long after the morning rush hour, it still took nearly an hour to travel the 25 miles deep into the wilds of Surrey to locate the river, then find a place to squeeze the van into on the narrow lane by the bridge. The club handbook says of the stretch, that it is seldom fished. I’m not surprised, four or five cars are the limit on this lane. The handbook also states that fishing here suits the roving approach, with the minimum of tackle. Again, one look along the undulating bank at the boggy path, stiles and gates ahead of me, meant that the trolley would have to remain in the van. One final whinge, the river was pushing through and coloured. Setting up for trotting a 6 No 4 Ali stem stick float, with an ABU 501 loaded with 5 lb line on my 12.5 foot Normark, I crammed a few necessities into my bait bag and headed off upstream to learn what I could about this virgin water. With plenty of twists and turns, this is what I call a real river, with the flow switching from bank to bank, creating slacks and eddies. Passing several likely fish holding areas, my progress was halted by a feeder stream, which had a bridge made up of two oddly angled planks, with no handrail, which would have challenged the SAS to cross safely. I turned round and walked back to a sweeping bend. This looked promising, but as on any new water, it is a blank canvas that needs a few trots through to begin to join up the dots. 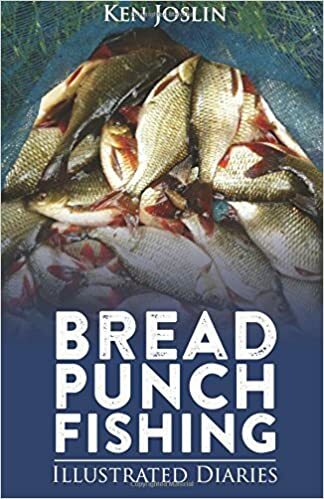 The bread feed had only been processed down to a coarse crumb that morning and held together with a light squeeze, dropping in a couple of egg sized balls upstream a rod length out, watching them break into attractive particles in the swirling current. The float carried away at speed from the rod top, the line spooling off the closed face reel, enough to hold the float back. After a few trots the float was set at 4 ft, with the shot bulked at the hook link, the size 14 barbless buried in an 8 mm pellet of bread. After several 25 yard trots my confidence was waning, when the float stabbed under half way down. It was a fish, not a big one, which danced in the flow, before coming to the surface, it’s silver flanks flashing briefly before it came off. 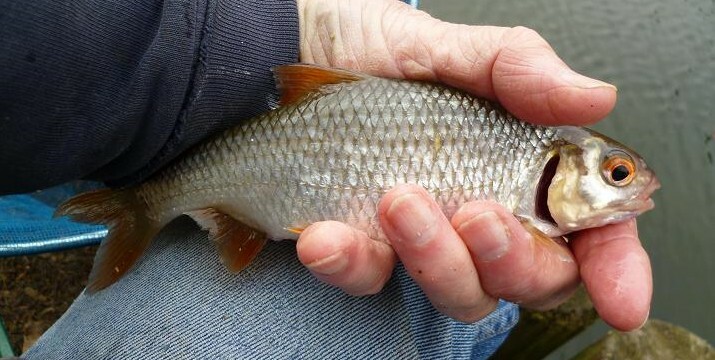 It did not feel solid enough for a roach, or dace and for a 4 oz fish did not pull hard enough for a chub. 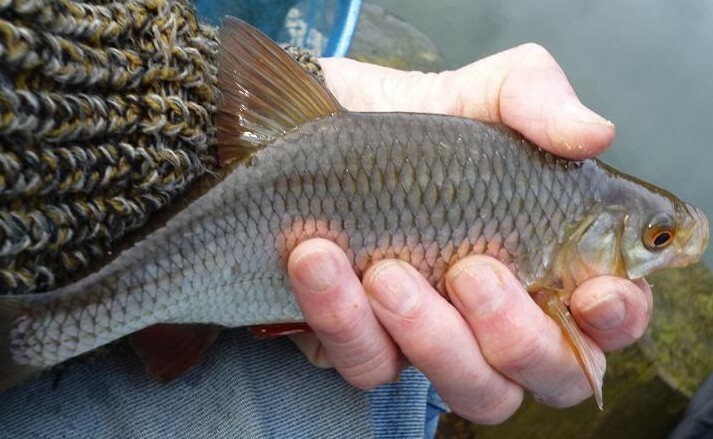 With skimmers and grayling in this river it could have been either. Putting in another ball, the float bobbed and lifted, then dived, the strike contacting a decent fish that ran off at full speed downstream, while I backwound furiously. In the coloured water it was difficult to see what I’d hooked, but the way it fought made me think that it was a trout. 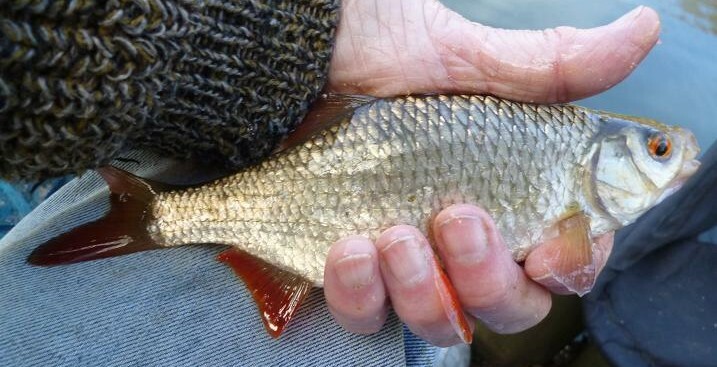 Rushing upstream under my feet, the fish was making for the roots of a bush, but side pressure brought it to the surface, a chub that now tried to tangle itself among weeds in the shallows, a swift sweep of the landing net making it mine. 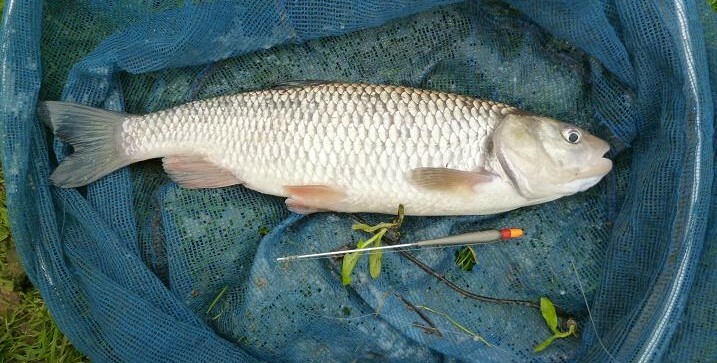 Phew, that was hectic, this 2 lb chub making the most of the swollen river. The hook was in the scissors of the jaw, needing the disgorger to push it free. Once released and after a calming cup of tea, I dropped in another ball of crumb, following it down with the float expecting another bite, but nothing and with the downstream wind blowing a gale, I considered moving, when the float kited over to the right. Bang! The strike caused an underwater explosion, pulling the rod down to the water and I lifted my finger off the line, allowing it to run free to avoid a break. Bringing the rod back up to the vertical, I put my finger over the spooling line and felt the full weight of the running fish, which jumped clear. A brown trout of over a pound was now rolling on the surface 20 yards away and I dropped the rod top in response, only for the line to go slack. It had come off. With the wind now at it’s worst, I gathered up my tackle and walked down to the next bend, where a sandy beach backed by a high bank offered shelter. The flow was directed along the far bank under several trees, although the wind was blasting this bank too and I gave up fishing an eddy under a stump, unable to keep a bow in the line from dragging the float. With this wind a heavier rig would have coped, but I was stuck with my original choice, however another greedy chub chasing the crumb feed made up for the lack of presentation, by sinking the float out of sight. Yes! I was in again and back winding to slow that initial rush, before the chub turned to swim along the opposite bank, fighting me and the current, that white mouth visible beneath the surface as I brought it across to the net. A pound plus fish. I was now realising that I had owned a permit for this water for a year and waited until the last day available to fish it. What a waste. These were fat fish, full of fight, caught in not ideal conditions. I was confident now that there were more fish to be had and cast again, hooking and losing a much smaller fish a few casts later. More crumb and a bumped fish made me think about a smaller punch, but the flow was washing bread from the hook and stayed with the 8 mm pellet. Walking to the end of the beach, I trotted the middle, the flow carrying the float over to my side towards a fishy looking groyne covered in bramble, holding back each time short of the jungle. Ten minutes of this and more feed being washed down kept my eyes glued to the orange float tip, as it passed close to the obstruction, pulling back and letting go. The line and float zipped downstream and I lifted to meet the full weight of another chub as it tried to get beneath the obstruction. The old Normark has a lot of backbone and I leaned back to heave the fish clear of the wooden posts, the line scribing a zigzag pattern on the surface, before making for deeper water. 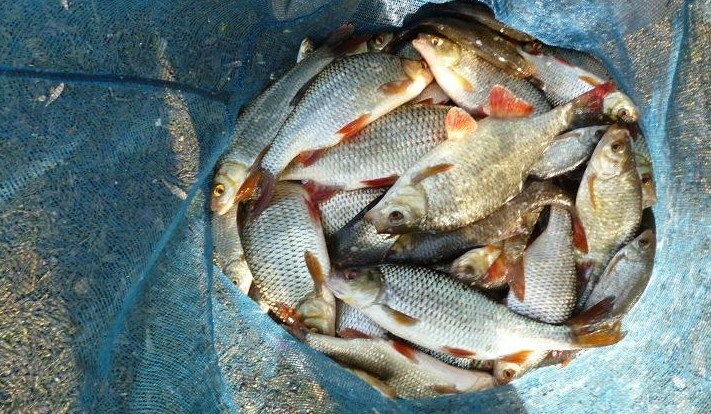 Maybe I’ve been catching too many lake fish lately, but these chub were in top condition, fighting all the way to the net. This one lived up to the chub name, being round like a barrel, giving me arm ache, staying deep and resisting all attempts to bring up until it was ready. The sun had come out and the wind eased, but decided to continue my exploration, walking down to a long nearside eddy that I’d passed on my way up. 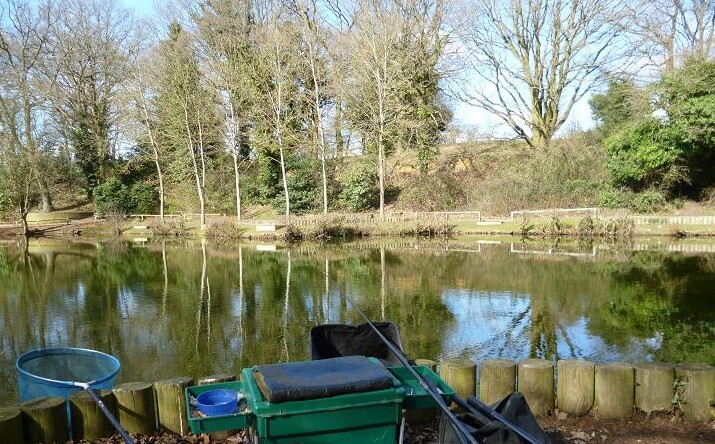 There was a definite crease between the fast and slow water and I hoped to find a few roach in the slack, dropping a couple of small balls in along the crease and switching to a 6 mm pellet of bread. The float wandered around in the eddy without a touch, so introduced another ball just in the flow followed by the float. The float bobbed and dipped with a bite then nothing. The bread was gone. Encouraged, this was repeated. Again no bait. The slice had dried out losing doughiness, going flaky. Getting out a fresh slice, I punched another pellet that looked a lot better and cast in. The bobbing began again, then the float sank away and I lifted into not a roach, but another chub that steamed off at full speed to the middle. Battle commenced again, the pounding fight giving way to the odd head shake by the time it was ready for the net. With another nice chub on the bank it was time to go. The bread had proved itself once again, this time on an unknown water. The locals would probably say that legered, hair rigged meat would catch more and bigger fish, but I was very satisfied with my session. The 35 year old Normark is a heavy rod by today’s standards, especially in a strong wind, while in my opinion the ABU 500 series of closed face reel is still the best stick float trotting reel going. 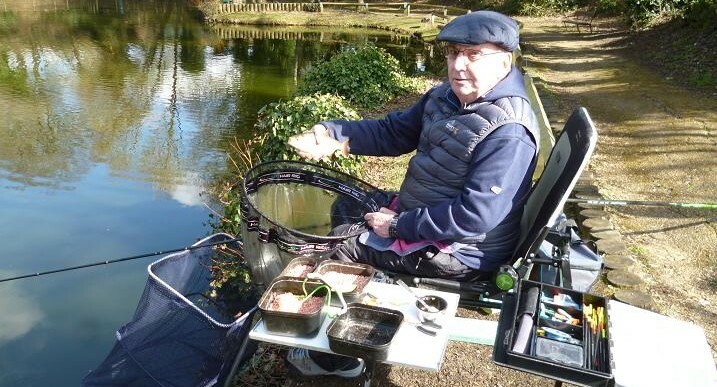 An invite to join an ex team mate and match fishing rival John, for a pleasure fishing session at Jeanes pond in Braybrooke park, seemed like a good way to catch up, while catching a few fish. John usually arrives at about 10 am after a leisurely breakfast and I aimed to get there about then, but the tone of the day was set with a phone call at 8:45 to say that he was already at the pond. Gathering up liquidised bread from the freezer, with a slice of white for the hook, I mentioned to my wife that John was obviously very keen, being more competitive than me. ” I find that very hard to believe” she quipped. I soon found out what sort of a session it was going to be, when I arrived to find him sitting rod in hand, waiting for the off. He was ready to dual, deciding to fish out toward the middle with maggot feed over a running line waggler rig, knowing that I would be trusting my day to the pole and bread punch. Overnight rain had passed through, revealing spring sunshine, although a sharp breeze was ruffling the surface. This was my third visit to the pond and chose to fish peg 5, which juts out into the water. Plumbing the depth, I found that the swim dropped away very steeply, being 6 ft deep at only 4 metres, and even deeper at 6 metres, leaving little line left between my float and the pole tip. Electing to fish up on the slope with the pole at 4 metres, John was swinging in his first roach, as I fed a small ball of crumb close to my float. The ball of feed did it’s job attracting fish to the area and I too was soon swinging in a small roach, followed by a clonking roach soon after. This was a welcome fish, as the majority were much smaller and I began counting them in. John was on 5 and I was on 15, but his were better fish. Going up from a 5 mm punch to a 6 mm just seemed to mean more missed bites and not bigger fish, so I switched back, the smaller punch proving a point with a nice rudd. I was still getting plenty of small roach, while my better fish seemed to equal John’s better fish at his lower catch rate. I was still ahead by more than twenty fish, when a trial cast with two more pole joints and an increase in depth, brought this rather scabby rudd, that was missing it’s top lip, evidence of rough handling and barbed hooks. More small roach followed and missed bites brought me back to the 4 metre line, where again I was rewarded with a good roach. John hooked a pike, that snagged him close to the bank, then bit through the hookline. My score was climbing and I could tell that he was getting rattled, as I counted off the fish. With a hooklink to tie, he was even considering switching to the pole, but time and bait had been invested in the waggler line, so he soldiered on, soon hooking a big rudd, which I came round to net for him. That cheered him up, this fish cancelling out several of mine, although I countered with another good rudd. With the pike gone, John’s swim continued to build, with much better fish coming to his net, while mine were getting smaller. Time for a change back to the 6 metre line, dropping the float among two balls of crumb. 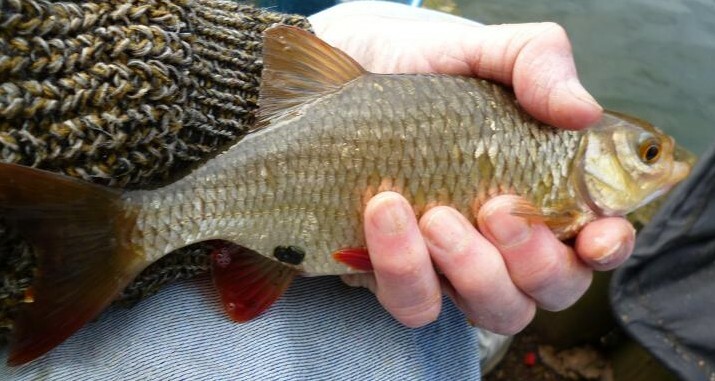 All day the bites had been fussy, with a few dropped fish, most just hanging onto the skin of the lip The next bite said small roach to me, but the elastic came out and the fish stayed down, the dull flash of a good rudd, willing it to stay on. We had agreed to finish at 2 pm and the words from John “That’s it, all in” then “Fish on” made my heart sink, as too late I had switched to the deeper line and found better fish, my last, a 4 oz roach, being No 80 in my net. John came round to my swim, while I pulled the keepnet out, the sound of a good bag greeting him. On the scales my fish went just over 8 lb, not bad for four hours, the eighty fish averaging under 2 oz each. We then walked back to John’s, where the sight of many fewer, but much better quality silver fish said it was going to be close. John’s expert arm lifted the net, and he grinned. “I think I’ve done you Kenny” He had too, by about 12 oz, the scales settling at 9 lb. It was a fair cop. 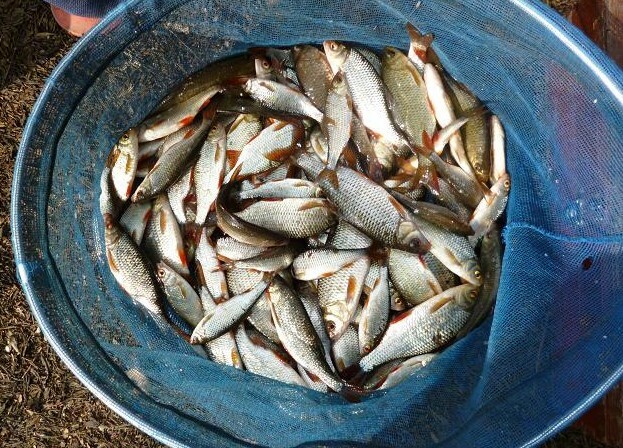 Two opposite methods had put good bags on the scales, it could have gone either way, the real winners being the members of this prolific water. John with his winning smile and impressive net of quality roach and rudd. 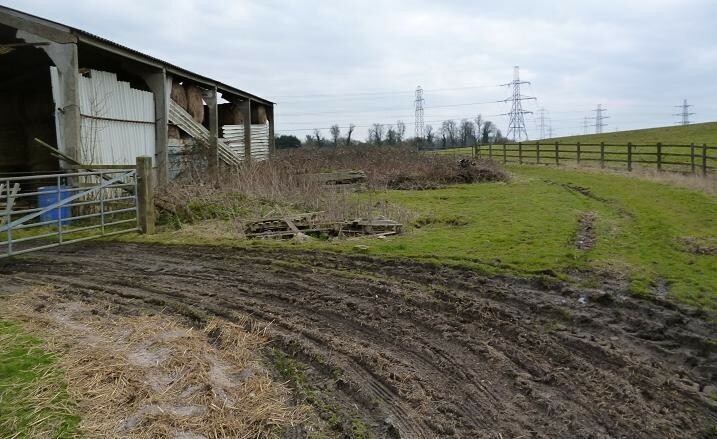 Last week I was pleased to get a call from one of my farmers in South Bucks, to tell me that he had moved his horses from a paddock and wanted to know, when I could come over to shoot the rabbits, that were once again increasing in numbers. This small farm is one of three dotted along a rural lane and he grazes Dexter cattle on the other two, which both have elderly owners, who have also given me permission to shoot over their land. Having not visited these farms since the Autumn, he got me up to date, as to how the other owners were, before we agreed to meet this week. An overcast, windy morning had given way to a bright afternoon, when I arrived at the farm, which has a mixture of grazing pastures ideal for the CZ HMR, while around the buildings I prefer the quieter .22 Magtech. The farmer was waiting as I drove into the yard and was eager to show me two rabbits feeding near the far fence eighty yards away. Without even putting on my jacket, the HMR was pulled from it’s case, a five shot magazine fed into place and the rifle cocked ready to rest on the fence for a shot. 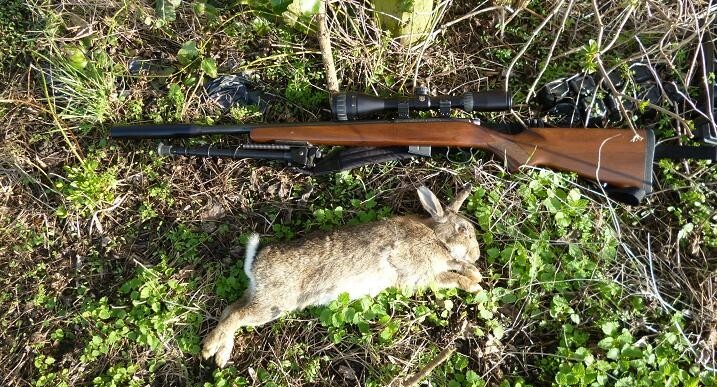 Unaware of the danger, the two rabbits were preoccupied and I sited on the one stretched out in the sun, causing it to leap up, when the bullet struck home. The other one ran in startled circles, before disappearing into the hedge. With nothing visible, I walked into the adjoining farm, where from the gate I can see the length of a narrow ten acre field. The sun was already low and it was the shadow of a rabbit, standing out almost black, that I saw first. With little cover at this time of year, I decided that it was better to shoot from 130 yards, than to chance spooking it by trying to get closer. Getting down prone for a shot off the bipod, with the magnification set at 12, I centred on the head, knowing that the light breeze would only drift the tiny 17 grain bullet a few inches at most. 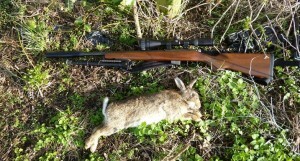 The rabbit just rolled over without a kick, the bullet passing right through it’s chest cavity and out the other side. Continuing along the hedge line I saw no more, but circling back along the other side, a rabbit was sitting up close to the entrance gate a hundred yards on. 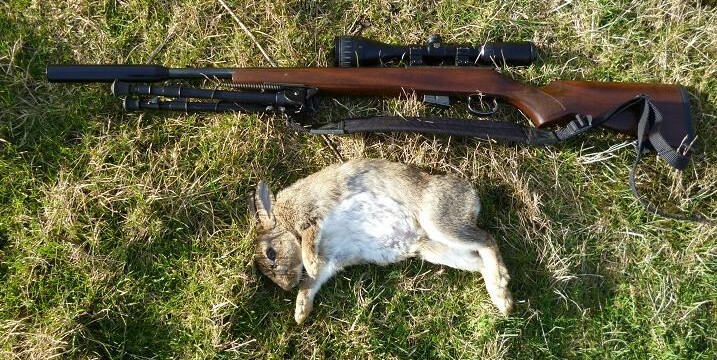 As I got down on the ground, the sound of the bipod clicking into place, caused the rabbit to sit bolt upright, ready to run and wasted no time in squeezing the trigger once the crosshairs found their mark. Back through the gate, a short walk along the path saw me overlooking the paddock again, where another pair of rabbits were busily feeding, moving from spot to spot. Further than the original pair, I followed one of them through the scope, the rifle again resting on the fence, until ready for the shot, that knocked it down. I waited around with the farmer for twenty minutes, but there were no more shows, even in the 15 acres abutting the paddock, despite his assurances that it had been alive with rabbits that morning. Loading up the van, it is only a short drive down the lane to the third farm, where I took out the Magtech .22 for a walk around the farm buildings. 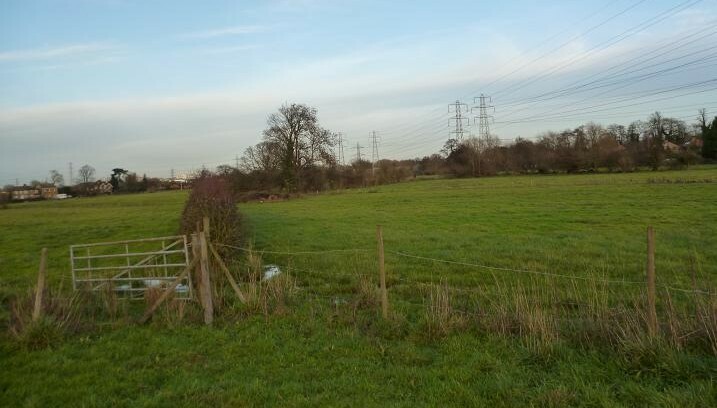 As I stalked the path, rabbits darted across it into the brambles through the fence, too fast to attempt a shot and I continued on to the field beyond, toward another warren in a hedge line. A rabbit was visible at 200 yards, but had melted back into the bushes, before I could get within range. The HMR could have taken it on, but I had made my choice of weapon and waited around in the cover of an old oak, in the hope of the rabbit venturing out again. 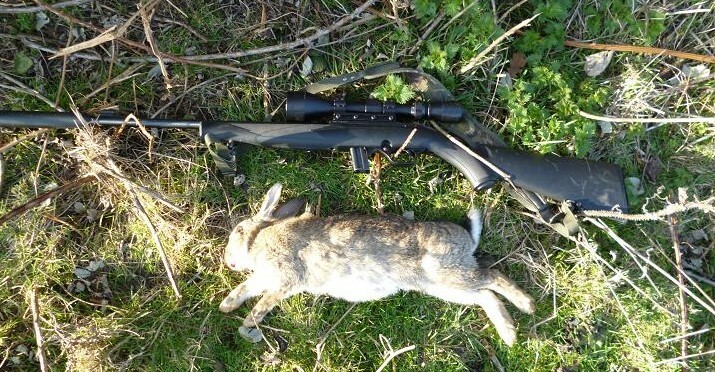 Looking back, rabbits were out on the hill again and made my way back to the farm in cover, hoping to surprise a few, but sighting on the first, the sun now shining beneath the clouds ahead of me, was whiting out the scope. All I could hope for was to get as close as possible and pick one off, when they saw me and fled back to their holes among the brambles. That’s what field craft is all about, learning the habits of your quarry. The rabbits did just that, potting this one as it threaded it’s way through the prickly jungle. Walking back to the van, I heard honking geese, the lady owner giving her flock their evening feed, going over for a chat to inform her, that I was back on the scene for another season.